As you know, our organization is a proud Associate Member of Partners for Healthy Pets (PHP) and we are very pleased to announce a collaborative program between PHP, Veterinary Medical Association Executives (VMAE) and CVMA. We believe this initiative will have a significant impact on the health of your patients and your practice. Why? We believe this initiative will have a significant impact on the health of your patients and your practice. This collaborative program focuses on the importance of forward booking, which simply means scheduling all patients’ next appointments before they leave your practice, regardless of the reason for their current visit. This includes medical progress exams and preventive healthcare exams. Forward booking ensures your patients receive the highest quality of care at the right time. You have probably been hearing about and maybe even considering implementing forward booking in your practice, but are not quite sure how to get started. 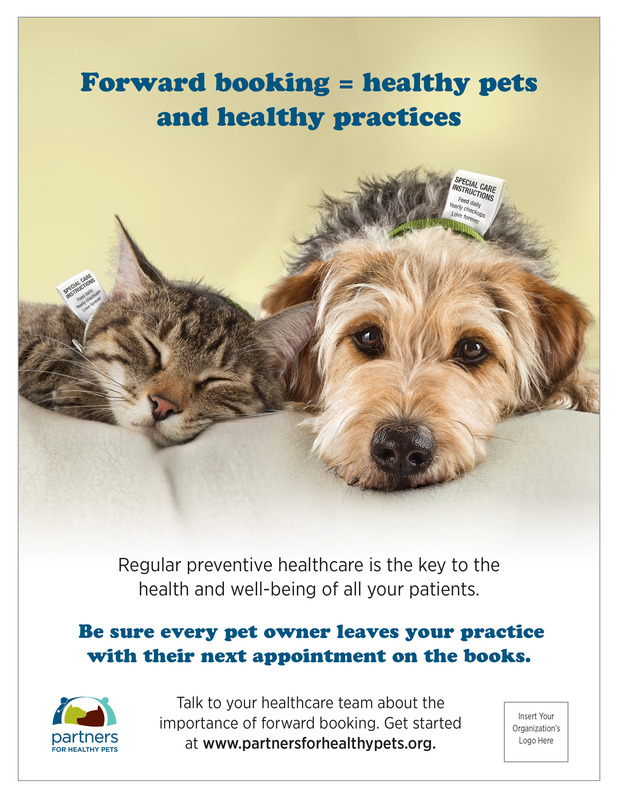 To get started, visit the forward booking section on the Partners for Healthy Pets website http://www.partnersforhealthypets.org/forward_booking.aspx. Download the document titled, “The Key to Forward Booking Appointments: Unlock the Potential of a Best Practice For Your Practice.” This gives you a simple, step-by-step approach to how to use the handful of tools available to you to provide your practice team with the skills necessary to be successful. Ready. Set. Forward Book! By using these tools, you will be able to easily implement forward booking in your practice. The result? Healthier patients and a healthier practice! Forward Booking WORKS! Testimonial Contest! To help publicize the benefits of forward booking, we are asking CVMA members who are executing the Ready. Set. Go! Forward Booking Campaign to send us testimonials regarding their experiences with forward booking. Through these testimonials, we hope to spread the word to the veterinary profession about real-life experiences from practices that have benefited from implementing forward booking and encourage all veterinary practices to adopt forward booking as a best practice. These testimonials will be used to highlight the success of forward booking and to encourage additional veterinary hospitals to incorporate this tool into their protocols. This is your opportunity to help promote healthier pets and healthier practices and to perhaps win a great prize for doing so. Join in! To enter the contest, we’re asking our members to share their experiences with forward booking, either in writing or through a short video. Our judges will select multiple winners, with $12,500 in total prize money to be awarded, including $2,500 for first prize. Learn more! Order FREE Buttons for Your Team! These buttons can prompt questions and help create awareness about the importance of forward booking. Buttons are available at no charge, thanks to Partners for Healthy Pets, and will be shipped to you in 5-button packets (2 cat and 3 dog). To order, email buttons@yorkeprinte.com and include the number of button packets you wish to receive.